This card has so much going on, it’s overwhelming. Why do you say that? 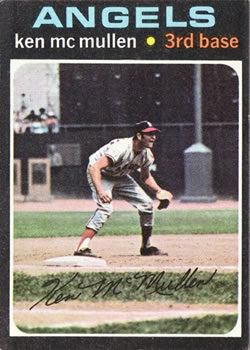 It’s just Ken McMullen fielding the hot corner. Alright, look to the left of Ken, look to the right of Ken, and look below his signature. It’s a virtual cornucopia of background noise. The first time I saw this card, I thought it was an ERR. For the life of me, I thought that was Brooks Robinson, and that Angels read Orioles. It must have been the dingy uni and the baby blue team font. Once I overcame my disbelief, I began to notice all that is awesome with this card. I think this may possibly be one of the best cards ever. Why you ask? Two words, Monument Park. That’s right, the heralded Monument Park prior to the 1970s Yankee Stadium renovation. Originally constructed in 1929, this park consisted of a Flag Pole and multiple monuments to Yankee greats of yore…in the outfield…in play. At the time of this photograph, the center field wall in Yankee Stadium was 461 feet, and all of Monument Park was in play. Makes Enron Field seem even lamer. Here is a composite photograph of Yankee Stadium when Monument Park was in play (see the bottom left corner). Another reason why this card is just over the top breathtaking is the dirt third base coach’s box. I can’t say I’ve ever noticed one of those before. I can almost see Larry Bowa refusing to wear a helmet in one right now.